Let’s talk about intersectionality and neurodiversity. Let’s start by defining terms. It seems like lots of folks are talking about intersectionality and neurodiversity, but people often define these terms differently, or they reference different senses of these concepts without defining them outright. So let me try to be clear about what I’m talking about. Basically, intersectionality is a concept that helps us to understand how people are socially positioned based on overlapping dimensions of difference. One underlying premise of intersectionality is that no one identity category is a monolith. So, because identities are always multiple and experienced in configuration with other identities, movements based on identity politics (like feminist, anti-racist, and disability rights movements) need to be intersectional to account for all primary stakeholders. Intersectionality is also premised on the idea that “identities have historical legacies, power differentials, and political consequences” (Yep, 2015). Some identity categories are granted status, privileged, represented as normal/good/preferred; others are oppressed, stigmatized, underrepresented, erased, positioned as not normal/bad/dispreferred. At its root, intersectionality is a Black feminist concept. The term was coined in the late 1980s by Kimberlé Crenshaw to describe how “the intersection of racism and sexism factors into Black women’s lives in ways that cannot be captured wholly by looking at the race or gender dimensions of those experiences separately” (Crenshaw, 1993, p. 1244). Crenshaw was responding to the invisibility of Black women’s perspectives in feminist and anti-racist movements. Since she coined the term, intersectionality has been taken up “as a tool for understanding and analyzing the complexities of oppression in the lives of marginalized groups” (Yep, 2015) more generally. As educator and sensei Nick Walker (2014) puts it, “Neurodiversity is the diversity of human brains and minds – the infinite variation in neurocognitive functioning within our species.” It’s “a biological fact” that encompasses all ways of thinking, being, and experiencing the world. For more insight on neurodiversity and to get a sense for what Autistic leaders in the neurodiversity movement are fighting for, check out my Links & Resources page. So when we talk about intersectionality and neurodiversity, what are we talking about? Why are we even talking about this? Neurodiversity is a big tent concept, but the neurodiversity movement has some work to do to include more marginalized members of the community at large. Neurodiversity advocacy is dominated by white, Autistic perspectives, and the movement has only just started to address ways in which neurodivergence intersects with other dimensions of difference, like race, gender, sexuality, and class. These differences make a difference. For instance, there are significant racial, ethnic, and gender disparities in the identification of autism in children. White children tend to receive autism diagnoses earlier than children of color (Mandell et al., 2009), and girls tend to be diagnosed autistic less often than boys (Shefcyk, 2015). There’s some research that suggests that gender divergence (that is, gender non-conformity, gender variance, or, what psychologists refer to as gender dysphoria) is more prevalent within the autistic population (Noens et al., 2009) than in the general population. And it’s well documented that students of color are overrepresented in special education (Ben-Moshe & Magaña, 2014). Add to these statistical justifications for intersectionality the lived experiences of neurodivergent people who inhabit multiple marginalized identities, like Black, Autistic mother and neurodiversity advocate Morénike Giwa Onaiwu (2015), who writes about her refusal to “splinter myself for others’ comfort or for any well-intended but incomplete cause.” Consider also cases like those of 18 year old Reginald “Neli” Latson and 11 year old Kayleb Moon-Robinson, both of whom have faced jail time and police brutality for the crime of being Black and Autistic (Brown, 2015). You might also note my focus on Autistic perspectives in my references, and wonder about intersectionality as it relates to other dimensions of neurodivergence, like intellectual disability or mental illness. There are some efforts being made to increase intersectionality within the neurodiversity movement. The folks on the Twitter chat #Autchat have had some good discussions about intersectionality as it relates to autism. There’s a forthcoming autism and race anthology that I’m really looking forward to. (Their indiegogo campaign ended in the fall, but you can still donate to the publisher, Autism Women’s Network, and specify that you’d like your donation to contribute to the anthology if you’re so inclined.) There’s a book called Ultraviolet Voices: Stories of Women on the Autism Spectrum that I just discovered and am now eagerly awaiting via mailorder. And there are some great writers talking about intersectional neurodivergence online, like Onaiwu and Lydia X. Z. Brown (editor of the aforementioned anthology on race and aforementioned article on police brutality, which provides an excellent summary of what intersectionality means btw). Also Cynthia Kim. And Kerima Çevik. And Sparrow Rose Jones. And others. There’s so much to talk about when we’re talking intersectional neurodiversity. 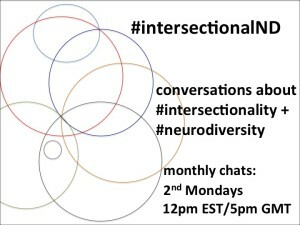 In the interest of building a node for MOAR conversations that move us toward a more intersectional understanding of neurodivergence, I’m launching a Twitter hashtag and chat, #intersectionalND. The very first #intersectionalND chat (on #intersectionality in #theory + #praxis) is scheduled for Monday, January 11, at 12pm EST. 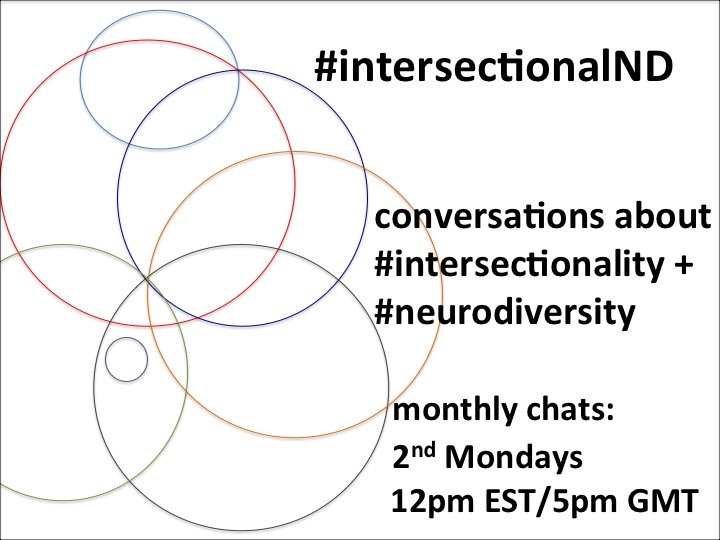 If you’re interested in talking about intersectionality and neurodiversity, do join in/lurk/signal boost/use the hashtag! Please also feel free to comment here, send me an email, or tweet at me (@JessMFH) with feedback, ideas, and/or suggestions. I’m also seeking co-organizers and moderators, so def get in touch if you’re interested in helping me get #intersectionalND off the ground. Chats will be held on the second Monday of the month. Follow @ntrsxnlND or me (@JessMFH) for updates. Adewunmi, B. (2014, Apr. 2). Kimberlé Crenshaw on intersectionality: “I wanted to come up with an everyday metaphor that anyone could use.” NewStatesman. Retrieved from http://www.newstatesman.com/lifestyle/2014/04/kimberl-crenshaw-intersectionality-i-wanted-come-everyday-metaphor-anyone-could. #Autchat. (n.d.). Search results for: Intersectionality. Autchat. Retrieved from http://autchat.com/?s=intersectionality. Autism Women’s Network. (n.d.) Autism and race anthology. http://autismwomensnetwork.org/autism-race-anthology/. Brown, L. (2015, Apr. 14). Undoing racism and anti-blackness in disability justice. Autistic Hoya. Retrieved from http://www.autistichoya.com/2015/04/undoing-racism-anti-blackness-in.html?m=1. Çevik, K. (n.d.). Intersected. http://intersecteddisability.blogspot.com/. Crenshaw, K. (1993). Mapping the margins: Intersectionality, identity politics, and violence against women of color. Stanford Law Review, 43, 1241-1299. Retrieved from http://socialdifference.columbia.edu/files/socialdiff/projects/Article__Mapping_the_Margins_by_Kimblere_Crenshaw.pdf. Hurley, E. (Ed.). (2014). Ultraviolet Voices: Stories of Women on the Autism Spectrum. Autism West Midlands: Birmingham, U.K.
Jones, S. R. (2013, Jan. 27). No you don’t. Unstrange Mind. https://unstrangemind.wordpress.com/2013/01/27/no-you-dont/. Kim, C. (2014, Nov. 19). At the intersection of gender and autism. Musings of an Aspie. http://musingsofanaspie.com/2014/11/19/at-the-intersection-of-gender-and-autism-part-i/. Lamm, N. (2015, Sept. 2). This is disability justice. The Body is Not an Apology. Retrieved from http://thebodyisnotanapology.com/magazine/this-is-disability-justice/. Noens, I. L. J., de Vries, A. L. C, Cohen-Kettenis, P. T., Doreleijers, T. A. H., & van Berckelaer-Onnes, I. A., (2009). Co-occurrence of autism spectrum disorders in individuals with gender dysphoria. International Society for Autism Research. Retrieved from https://imfar.confex.com/imfar/2009/webprogram/Paper4222.html. Onaiwu, M. G. (2015, Dec. 15). All of me: How do I know where blackness ends and neurodiversity begins? Just being me…Who needs normalcy anyway? Retrieved from http://whoneedsnormalcy.blogspot.com/2015/12/all-of-me-how-do-i-know-where-blackness.html. Shefcyk, A. (2015). Count us in: Addressing gender disparities in autism research. Autism 19(2), 131-132. Retrieved from http://aut.sagepub.com/content/19/2/131.full.pdf+html. smith, s.e. (2011, Mar. 8). Why I’m leaving feminism. This Ain’t Livin’. Retrieved from http://meloukhia.net/2011/03/why_im_leaving_feminism/. Walker, N. (2014). Neurodiversity: Some basic terms and definitions. Neurocosmopolitanism. Retrieved from http://neurocosmopolitanism.com/neurodiversity-some-basic-terms-definitions/. Yep, G. (2015). Intersectionality. Key concepts for intercultural dialogue, 49. Retrieved from https://centerforinterculturaldialogue.files.wordpress.com/2015/02/key-concept-intersectionality.pdf.